If you consider yourself among the “repairers of the breach,” this one’s for you! I was only in the US Army for about four years, but was blessed to attend multiple special skills schools as well as a nice variety of deployments to several parts of the globe. 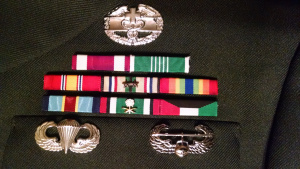 When Napolean Bonaparte said, “a soldier will fight long and hard for a bit of colored ribbon,” he might have been speaking of me. No question, I loved the challenge of hard schools and difficult duties. In a twisted way, suffering is fun. It separates the men from the posers. In spite of the fact that I recognize those bits of colored ribbon fade and will eventually be destroyed by fire, I still pine for those days of testosterone, sweat and tears. Maybe it’s just the way I’m wired. Very enjoyable, maybe if we share with each more we can realize we are all struggling with this. Thank you for sharing and inspiring me to work everyday on repairing the breach. I was a drug user before redemption in 2012 by Yahoveh,now they say she went from a drug addict to a Jew which I try to explain I am not a Jew that the commandments are for everyone and the feasts days are his, to no avail. I am so thankful to be his and have brother’s and sister’s all around the world trying to become more set-apart and do Kingdom work. Blessings & Shalom! !